2+2=4: LESSON TIME: Who Is The Ruler of America? A Great Warrior for Christ. I want to share this exchange because it is enlightening and exposes a mindset grappling with American Liberty. My friend is a deeply dedicated Christian, a convert from Islam - and these LESSON TIME entries have been inspired by our exchanges. He is trying to deal with the Eastern Orthodox teachings on submission to authority, a subject of interest to Christians in the U.S. and a great source of confusion to many Orthodox teachers and Orthodox Christians in America and around the world. Sorry if we cannot agree on some of our wording but seems that in heart, we are probably the same mind. FIGHT for Christ ALWAYS or we lose the real battle. Fight militarily when we must, but realize how the Christians lived under Diocletian, Nero and many other nonmuslim atrocities from the beginning. Jesus could have called on His Angels to change our government and make him King and the people were ready (John 6:15), but he refused. I am strongly in favor of fighting militarily when we must and can as long as we ALSO fight for our own souls at the same time. If we don't have Christ preserving our hearts and focus on the wrong enemy, we can become part of his force on earth by fighting only the government and not for our souls. Genocide of muslim villages was used to build propaganda AGAINST our Orthodox countries. While if we compared the real numbers of 15,000 vs. 2.8 million, it is much less (thank God), I would NOT want to have murdering of children and Moms become the rule of our day just because those children and Moms are muslims. 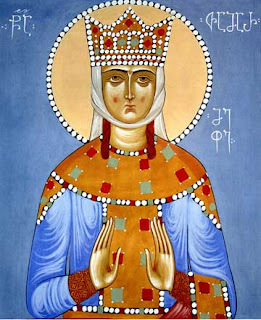 Great example of war that is just and balanced was St. Tamara, Queen/King of Georgia. She fought and led the army to battle and win against muslim invaders WHILE at the same time, she abided in regular prayer and almost monastic dedication to God all her life. Her treatment of conquered muslim villages led them to FREELY choose to follow God in Christ Jesus and thousands of muslim villages were Baptized into our Holy Orthodox Church. There is nothing my friend wrote here with which I disagree, however he hasn't actually spoken to the American situation: Here is my reply. Those raised in Eastern Orthodoxy in the old world, and Muslims speak from a false paradigm when dealing with these issue in America. Even the term "ruler" does not apply here, because as instituted by God, the American people are the "Ruler" here, (clearly stated in our Constitution, "WE The People, in order to form a more perfect union . . . " NOT we the elite, we the royal, we the kings, we the princes, etc." Collectively are THE Sovereign, and just as Pharaoh delegated a certain amount of power (in fact a great amount of power) to Joseph, Joseph was never the "ruler" only A governor delegated certain powers. Had Joseph tried to exercise power outside of his delegated authority, the rule, Pharaoh would have used what ever means necessary to conquer the usurper. The president of the U.S. is NOT a ruler, he is delegated certain powers by the ruler, which is the American people. So you see in a real way, none of the models previously used by Eastern Orthodoxy apply directly to America. Of course all the "moral teachings" do apply, so that we are not anarchist, but subject to "rightful rule." We are subject to our fellow citizens, who are Ordained by God to rule. We ARE subject to properly delegated and exercised powers of those delegated to govern, but the second that those "governors" step outside of constitutional right, they have become "outlaws" and in truth hold no legitimate power over the ruler who installed them. The rebellion of those delegated authority by WE THE PEOPLE, would be no different if Joseph had rebelled against Pharaoh. WE THE PEOPLE never abdicate our place as Ruler, so ordained by God and as long as there are any citizens who grasp this truth, we NEVER will. Of course I do not suggest "genocide of muslims." This is of that false paradigm earlier mentioned. Nor do I suggest persecution of muslims or mis-treatment of muslims. I say rather that although a muslim may be delegated certain and particular powers to "govern" he/she will never be "ruler." I as a citizen am only subject to such a governor when they exercise "properly delegated powers." Obama has clearly stepped outside of constitutionally delegated powers and become a usurper. He is a criminal to the American people not our president. Many millions at this point realize that, many millions do not. Your last paragraph we are in perfect agreement. Yes, I agree that St Tamara's example shines, but again the model does not exactly fit. At this point in time our greatest enemies are within, as you know well and we have discussed on many levels. Those who refuse to accept constitutional limits of governance are our enemies, usurpers of "rule", whether foreign or citizen.